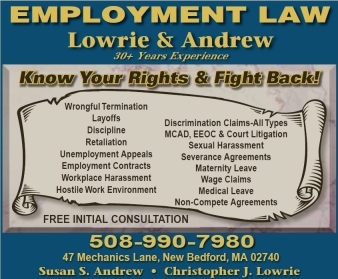 Unlike most law firms south of Boston, we at Lowrie & Andrew Attorneys at Law primarily focus our practice on employment law, discrimination law, civil rights law, and labor law. Our lawyers have been representing employees throughout Southeastern Massachusetts in discrimination, civil rights and labor law cases for over 30 years. 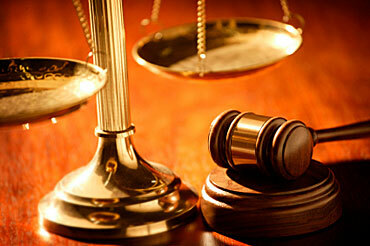 If you want to know your rights and fight back, contact our firm to schedule your free initial consultation. You can call 508-990-7980 or submit the contact form below. Phones are answered 24 hours a day, and we offer flexible appointment scheduling. Map and directions to our 47 Mechanics Lane office in New Bedford, Massachusetts. Lowrie & Andrew Attorneys at Law is located in the quaint historic district of New Bedford, Massachusetts. Our firm provides employment law representation to clients throughout Southeastern Massachusetts and the South Coast including those from New Bedford, Fall River, Taunton, Cape Cod, Fairhaven, Acushnet, Dartmouth, Westport, Mattapoisett, Marion, Rochester, Lakeville, Freetown, Wareham, Rehoboth, Raynham, Somerset, Swansea, Seekonk, Norton, Dighton, Mansfield, Attleboro, North Attleboro, Assonet, Bridgewater, Easton, Middleboro, Middleborough, Plymouth, Brockton and throughout Norfolk County, Bristol County and Plymouth County. This website may be considered "advertising" under Massachusetts Supreme Judicial Court Rule 3:07. The contents of this webpage are for informational purposes only and should not be considered to be legal advice. This web page does not establish an attorney client relationship. Copyright © 2009 by Lowrie & Andrew Attorneys at Law. All rights reserved. You may reproduce materials available at this site for your own personal use and for non-commercial distribution. All copies must include this copyright statement.